Is your dog having trouble learning household manners? Is he jumping on guests, running out the door, chewing on furniture, rugs or toys? Is he pulling you down the street on a walk? Does your dog have aggression or separation issues? Or maybe you want help with crate training, housebreaking, or basic through advanced obedience. Here, we can teach you to enjoy the process of training while teaching your dog to listen and pay attention to you using gentle and positive methods. You have come to the right place, where training is effective, fast, and so much fun! Serving Lancaster County, PA and surrounding areas, Bonnie is a certified dog trainer through Animal Behavior College and a professional member of the Association of Pet Dog Trainers. She helps coach owners to learn to communicate and bond with their dog. 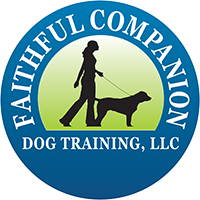 Faithful Companion Dog Training is customized to your needs and life style. We offer private instruction at reasonable rates because every dog and owner learns in an individual way, and at a faster pace if they start in their own homes. Group classes for puppies and dogs are also offered. These classes offer socialization with other dogs, and are fun! Bonnie also offers dog training while you work. Please look through the web site, and if there is information that you are unable to find, please feel free to call or email. We look forward to meeting you and your faithful companion! Through coaching guardians of canines to train their dogs with positive methods and a gentle approach, we strive to support owners to create a very special bond with their dog. Through interaction and communication, this unique relationship is developed by owners and their dogs who work together with love, trust, and respect for each other.